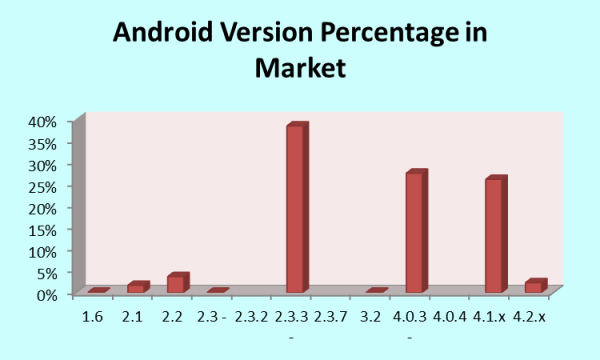 As reported by Android and quoted by CNET, the Jelly Bean with ’28.40%’ users, is now emerging as the leading Android version in android Ranking, pushing back the Ice Cream Sandwich which is occupying the Android market with just ‘27.50%’share. But Gingerbread is still at the top with ‘38.40%’ in Android market. Note: This data given above in the table was collected during a 14 day period, ending on May 1, 2013. Talking about the apparent reason of the increased adoption rate of Jelly Bean, CNET is of the view that though Jelly Bean was just released in July last, is gaining fast on Gingerbread which was released in December 2010. Gingerbread was commanding more than 50 percent of the Android market at the end of 2012 but the Jelly Bean adoption is higher by 180% since that time. The major cause of this sudden change seems to be Galaxy S3 of Samsung which is sold more than 50 million set units since its release in May 2012. It is expected that with the expected sales for Galaxy S4, the new flagship of Samsung, Jelly Bean is expected to over excel all the versions of Android, including Gingerbread, in near future.